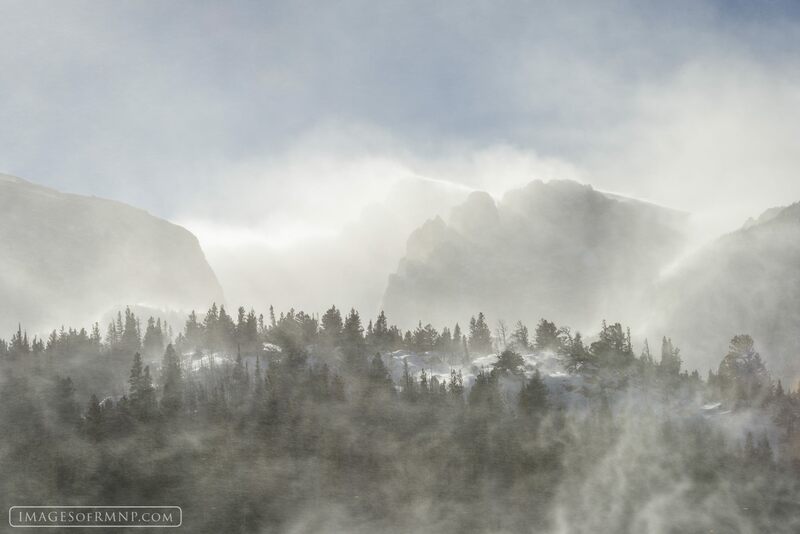 Winter wind in Rocky Mountain National Park. Photo ©️ Erik Stensland, Estes Park, Colo. Used with permission. Click to enlarge. Most of us have probably seen snow swirling in eddies across a street or off a rooftop. And the lucky among us have seen banners of wind-driven snow streaming from mountain peaks. But neither situation explains how the very air comes alive when winter winds roar through the mountains. It may look like a fairyland in this photo, but when the wind kicks up (90 mph is not uncommon), it can be a nightmare. And dangerous. Stensland abandoned his trek this day when he discovered large branches and even whole trees were being toppled. I was entirely cold enough before seeing this – now thinking i need a big mug of hot tea to hold onto. Did you have hiker flattening gusts hit you at the Keyhole, in the Trough, or on the Home Stretch during your climb up Longs? So hard to comprehend hurricane force winds blowing snow, yet that is the source of this beautiful photo. Really like my fairly warm office at this moment! No, I was very lucky when I climbed Longs. Clear, warm, windless all day. Plenty of climbers have been turned back by the wind and a few even blown off and killed. Looks more magical than usual. There are many posts on WordPress that brings this to me, here is another, that I follow but from another country, beautiful photographs of winter, but with a calmness. You might enjoy these too. Hope Pied doesn’t object. But they’re from my No2. Pied is No1 ! What I wondered PT, when I went in close like you suggested, was; are there any of those beautiful elks stuck out there in all that? Magnificent shot; the people that go out there, and do this must be a very special type; with gentle minds, to capture this. how else can than go out otherwise? In winter the elk move down to lower elevations (like Estes Park) to avoid conditions like this. Luckily for all of us, Stensland is an intrepid photographer who goes out in all conditions at all times of day or night to get the shots he wants of the things he loves. In weather like that I think obsession would be a better word than love. He can have it on his own, and we can sit back and enjoy it! It’s his profession. He knows what sells, what he has already and what he doesn’t have. And he turned back when conditions went from unpleasant to dangerous. I very much appreciate the effort he puts in to getting such great pictures so that I can continue to enjoy the park from the comfort of my living room. I can feel the sting of ice crystals. I can’t imagine being out in that, standing against the the wind while setting up a tripod, framing your shot, getting the exposure just right, etc. Ansley Adams? There was a time when I braved the elements…without a tripod. Did Ansel Adams go out in weather like this? I love his work but can’t recall any where he was in a windstorm like this. Yes, a tripod would be cumbersome, but Stensland once mentioned the weight of the pack he routinely carries, and it was big (50 lbs?). I think he always takes a tripod.